In regard to educational matters, Adair County has kept pace with the majority of the counties in the state, but yet has room for great improvement. The education in certain parts of the county is better managed and housed than in other parts, as, for instance, in Greenfield there is a handsome high school building, an account of which is given further along, while in Fontanelle there is a sad need of better quarters for school purposes. Just recently in the latter place the proposition to issue bonds for the erection of an adequately large school building was defeated by popular vote. It is reasonable to suppose, however, that not many years will pass before the whole of Adair County will be splendidly supplied with school facilities. 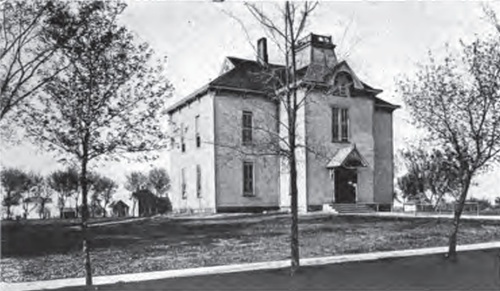 The first school in Fontanelle was held in the old courthouse in the year 1857 and was taught by Miss Hulda Lee. School District No. 2, which consisted of Sections 3, 4, 9 and 10, had a schoolhouse erected on the southeast quarter of Section 4 in 1882, costing about four hundred and sixty-five dollars, and Miss Minnie Patterson was the first teacher. There was a house of frame erected on Section 2 in 1883. Miss Ella May was the first teacher in this building. In Jackson Township the first schoolhouse was built on the farm of Alfred Jones on Section 3 and was a small frame building which was afterwards sold to Jones. The first officers of the district were Alfred Jones and Azariah Root. The first teacher was John Flannagan. In District 3 there was a school constructed in 1876 and Nettie Simmons, later Mrs. William Green, was the pioneer teacher. In District No. 5 the first school was put up in 1883 at an expense of $480. The first teacher was Malinda Barnard. A large house was built on District No. 6 in 1872. Maggie Christie was the first teacher. In 1873 a schoolhouse was erected in District No. 7, costing $450. Lydia Priddy, later Mrs. Charles Burrell, was the first teacher. A schoolhouse was built in 1882 in District No. 8 and George Pratt was the first instructor. District No. 9 had a schoolhouse erected in 1882 and the first teacher was Eva Sears. In the Town of Fontanelle a schoolhouse was erected in 1881. This building stood on a hill in the southwest part of town. The contract price for this structure was $10,400. The draft and design were the work of Corry & Loft of Sioux City, and J. B. Aldrich of Atlantic was the contractor. At the time the edifice was the finest in the county, but today it is not by any means and there is great necessity for increased accommodations for the children of the town. The first school in Jefferson township was taught by Simon Barrows during the winter of 1856-7 in a cabin which then stood on the farm of J. B. McGinnis on Section 35. The pioneer schoolhouse in the township was erected in 1858 by John Loucks at a cost of $800. This was built on Section 27 and was later used as a house of worship by the Christian denomination. Judge Holaday and Strover Rinard laid the foundations and the latter shaved the shingles for the roof. The first teacher here was a man named William Crandall. The second teacher was a Miss Cady. The first school officers were the following named: John Easton, president; George B. Wilson, secretary; John Loucks, treasurer. These all served during the year 1857. A schoolhouse was constructed on the northeast corner of Section 11 in 1872 and the first teacher was Emma McPherson, afterwards Mrs. W. C. Pugh. The building cost $700. The first teacher in the schoolhouse on Section 4 was W. B. Martin. In 1876 a building was erected on the northeast corner of section 7. The first teacher was John Nunan. In the school which stood on the southeast corner of Section 18 the first teacher was Sue Holaday. In 1872 a school was built on the southeast corner of Section 14 and the first teacher was Sarah Sankurne. A school was erected in District No. 7 in 1869, in which J. S. Smith was the pioneer teacher. Another schoolhouse was erected on the northeast corner of Section 36 in October, 1878. The first teacher in this building was O. W. Baker. On the southeast corner of Section 28 a school was built in the late '70s and the first teacher was Thomas Neville. In 1875 a school was constructed on the northeast quarter of Section 31. Sylvester N. Crowell was the first teacher in this building. Prior to the building of this house school was held in the district and Mrs. Jennie Dutton was the first teacher. During the great wind storm of June, 1880, the schoolhouse in District No. 8 was blown down the hill upon which it stood, a distance of about one hundred and twenty feet. The force of the wind turned the building half around and on its journey it came in contact with some burr-oak hitching posts which it broke clear with the ground. The chimney was destroyed and quite an amount of damage done to the building. The teacher's desk was turned over, but the side lamps upon the walls were not shaken from their brackets, nor broken. The stove was distributed all over the building. The coal house was torn to pieces and a piece of board with the staple and padlock was carried half a mile by the wind to the residence of John J. Payne, at that time director of the district. In Summit Township the first school was taught in the summer of 1870 by E. M. Day, in a small building owned by himself on the farm of Azariah Sisson on Section 16. This school was in operation for three or four months. In the fall of the same year a schoolhouse was built on the northwest quarter of Section 17 and in this Mrs. L. Allard taught the first school in the winter of 1870. This building was afterwards moved from this location to the southeast quarter of Section 18. The first directors of this district were L. Albee, Azariah Sisson and Abner Sisson. The second schoolhouse in the township was built on the northeast quarter of Section 21. It was erected in 1874. The first school taught in Adair was held in the upper story of the D. W. Moss drug store in the winter of 1873-4. The teacher who held it for three months was Mrs. H. P. Starr and she had about eighteen scholars. The next term was at the schoolhouse in the summer of 1875. Mrs. Starr taught this school also, as she did in the summer of 1876, the latter year of which she had sixty-six pupils enrolled. The next teachers were L. M. Hawes and his daughter. The first officer in this district was John Chestnut, Sr. The first schoolhouse in Washington Township was erected by volunteer labor in 1855 and was built of logs. This house was located on Section 9. The first term of school was taught by John J. Leeper. The first school taught in the township was at the residence of Thomas Johnson during the winter of 1851-2. This was also the first school taught in the county. The teacher was Dianthe Richardson, afterwards Mrs. Joshua E. Chapman. The first school in Orient Township was taught in the cabin of Reuben Dillow in the summer of 1863 by Kate Sawyer of Nevinville. She also taught a school in 1864 at the same place, but in 1865 it was taught by a niece of Mr. Dillow. Old School District No. 1, which embraced all of sections 1, 2, 11 and 12 and the north quarters of sections 13 and 14, had a schoolhouse built in the summer of 1875 at a cost of $550. Ella Thatcher was the first teacher. District No. 2, including sections 3, 4, 9 and 10, had a building erected in the summer of 1883. Lettie Hamilton taught the first term here. A school was built on the southeast corner of Section 6 in 1872 and W. E. Caton was the pioneer teacher. Stanley Milner erected a schoolhouse upon the northeast corner of Section 19 in the summer of 1870. J. C. Hoffstatter constructed a building on the southeast corner of Section 30 in the summer of 1877. The first teacher in this district was Sylvia Hoffstatter. The same man built a school on the northwest corner of Section 34 in the summer of 1879. Callie Yeck was the first teacher. In the summer of 1878 Hoffstatter placed a school on the northwest corner of Section 36. In the summer of 1880 a school was built on the southeast corner of Section 14. J. C. Hoffstatter had the building contract. In the fall of 1880 a Miss Snodgrass taught the first term of school. The original District No. 9 included the Town of Orient. The first schoolhouse of the district was burned in March, 1872, and a new building was erected in the summer of 1873. The first school in Lincoln township was taught at the dwelling of Robert Ewers prior to the completion of a schoolhouse. Rebecca Macy was the teacher. The first schoolhouse in the township was commenced in 1862 and completed in 1863. A school was erected on the southwest corner of Section 3 in 1875 at the same time the district was organized then known as the Independent District. Previous to this organization a rough dwelling had been used. The first teacher was M. W. Haver. During the fall and winter of 1874 a school was erected on the northwest corner of Section 20. The first school held in this vicinity was taught in granary of James Birchard by Lydia Clifford. The next term was taught at the home of Charles Lockwood on Section 18 by the same teacher. William Reynolds was the director at the time. Another school was built on the northwest corner of Section 24 in the fall of 1870. The first school in this district was held at the dwelling of Joseph Barnett in the winter of 1869 with M. W. Haver as teacher. In 1869 a schoolhouse was built on the southeast corner of Section 16. When the school was first erected this territory was a township district, and in 1870 two terms of school were taught by Etta Steavens. At that time the district was discontinued for lack of scholars and subdivided. A school was built on the southwest corner of Section 25 in the fall of 1868. In the winter of the same year a term of two months was taught by Reno Stevens, for which he received $90, there being five scholars in the class. On the southwest corner of Section 27 there was a house built in 1870. Prior to this, however, a term of school had been taught by Mrs. Stevens during the winter of 1869 in a small shed fitted up as a schoolroom on the east half of the northeast quarter of Section 28. The first teacher in the new school was Edward Morris. 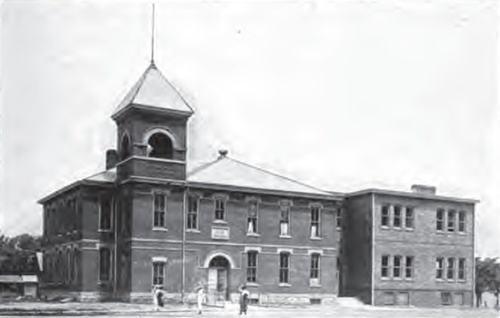 A school building was constructed in the fall of 1874 on the southwest corner of Section 29. Frank Gilpatrick taught the first term of school in the district in the winter of 1874-5. The first teacher in Grove Township was a Mrs. Lank, nee Addie Lawson, who taught a term in a private house on Section 33 in 1862. She later moved to Guthrie County. The first school erected was on Section 4 in 1862. The first school directors of the township were Simon Byers and J. R. Pierce. The other early teachers in this township were: Myrtle Crawford, Mary Allen, Hannah Calkins, Mattie White and Julia Oliver. The first school in Eureka Township was held in the residence of George W. Snyder in the summer of 1871, the class being taught by Emma Snyder Trowbridge, later Mrs. Fred H. Cears. There was at that time no school building in the township. The district was first organized in the summer of 1870 and the following officers elected: Orlando Howe, G. W. Snyder, Sr., and J. R. Patten, directors: W. R. Snyder, treasurer: A. Wright, secretary. School District No. 1, covering sections 1, 2, 11, and 12, had a schoolhouse built in 1875 and Clementine Yerkes was the pioneer teacher. Other first teachers of the township were: J. H. Crowley, Jennie Sargent, Stella Madison, Fred H. Cears, George Olmstead, James D. Law and May Faurote. The first school in Richland Township was built in 1858. It cost $400 and was 20 by 24 feet in size. The first teachers in the township were: Hulda Dorn, Lilly Moyer, Sarah Jewett, Eliza Arnold, Nellie Ray, Theresa Greene and Lue McClure. Some of the first teachers in Walnut Township were: Mary Thompson of Winterset, George Pratt, William Armstrong, John D. Keeney, Sallie Rutt, Joseph Lesher, Annie Sheltins, Mary Duncan. The first school taught in Harrison Township was in 1857 in a building erected for a storehouse on Section 34. The first schoolhouse was erected in 1860 on Section 34. The first teacher was a Mr. Carr, employed by the trustees of the township. Samuel W. Pryor was the first director, being elected in 1859 or 1860. There was no county superintendent at that time. Some of the early teachers of the township were: Hattie Shober, Sally McCauley, Sally Myers, Cornelius Smith, Emma Rush, Leonard Beard, Maggie Ralston. The first school building in Lee Township was a small structure erected in 1866 in the center of Section 16, 16 by 20 feet in dimensions. About a year following its erection it was removed to the northern line of Section 16, a distance of half a mile. There was no school taught in the building until the spring of 1869, when Eliza Wagner taught the first term, it being the first school taught in the township. During the year 1876 this building was bought by Wesley Rogers and removed to the Town of Greenfield, where it was used as a residence. A new building was erected in its place the same year. Some of the pioneer teachers of this township were: Eliza Wagner, Sadie Dew, W. F. Mason, Esther Ward, John Warner. The first school teacher in Prussia Township was Jacob Sager. Others were: Miss Sackett, --- Walker, Mary Campbell, Anna Shetters, Jennie Strouser, Miss Sergeant. The first school in Union Township was taught by William Kivett in 1857 in a schoolhouse built in the same year on Section 12. Adair has 1 male and 8 female teachers; an enrollment of 293 and a total average attendance of 245; there are 2 schoolhouses valued at $34,000. Greenfield has 1 male and 14 female teachers; 430 enrollment and 363 average attendance; 2 schoolhouses worth $30,000. Bridgewater has 1 male and 3 female teachers; 91 enrolled and 78 average attendance; 1 $4,000 schoolhouse. Fontanelle has 1 male and 8 female teachers; 227 enrolled and an average attendance of 187. There are 2 schoolhouses valued at $15,000. Orient has 1 male and 6 female teachers; 166 enrolled and an average attendance of 127; 2 schoolhouses valued at $16,000. Eureka: 1 male and 15 females teachers; 115 enrollment; 91 average attendance; 9 schoolhouses, value $4,5000. Grand River: 2 male and 10 female teachers; 187 enrollment; 115 average attendance; 9 schoolhouses, value $7,200. Grove: 3 male and 14 female teachers; 182 enrollment; 114 average attendance; 9 schoolhouses, value $45,000. Harrison: 2 male and 14 female teachers; 194 enrollment; 127 average attendance; 9 schools worth $2,850. Jackson: 2 male and 14 female teachers; 158 enrolled; 108 average attendance; 9 schools worth $2,850. Jefferson: 1 male and 13 female teachers; 240 enrollment; 137 average attendance; 9 schoolhouses, valued at $8,100. Lee: 1 male and 11 female teachers; 111 enrolled; 22 average attendance; 7 schoolhouses, valued at $5,178. Orient: 10 female teachers; 114 enrollment; 90 average attendance; 8 schoolhouses, value $4,000. Prussia: 1 male and 16 female teachers; 153 enrollment; 122 average attendance; 9 schoolhouses, valued at $42,000. Richland: 1 male and 13 female teachers; 151 enrollment; 86 average attendance; 9 schoolhouses, value $4,350. Summerset: 12 female teachers; 140 enrollment; 84 average attendance; 8 schoolhouses, value $3,600. Summit: 1 male and 11 female teachers; 124 enrollment; 85 average attendance; 7 schoolhouses, value $3,700. Union: 1 male and 15 female teachers; 195 enrollment; 95 average attendance; 9 schools, valued at $3,750. Walnut: 15 female teachers; 194 enrollment; 174 average attendance. Washington: 4 male and 13 female teachers; 181 enrollment; 104 average attendance; 9 schools, valued at $3, 250. Bailey: 1 female teacher; 7 enrollment; attendance 4; 1 school worth $1,000. Harmony: 2 female teachers; 15 enrollment; 9 average attendance; 1 $600 schoolhouse. Lincoln Center: no teachers; 1 $1,000 schoolhouse. Mount Vernon: 1 female teacher; 12 enrolled; 8 average attendance; 1 $600 schoolhouse. North River: 2 male teachers; 20 enrolled; 16 average attendance; 1 $1,000 schoolhouse. Pleasant Hill: 1 female teacher; 13 enrolled; 9 average attendance; 1 $900 schoolhouse. Pleasant Ridge: 1 female teacher; 11 enrolled; 4 average attendance; 1 $950 schoolhouse. Prairie Queen: 3 female teachers; 17 enrolled; 8 average attendance; 1 $300 schoolhouse. Washington: 2 female teachers; 17 enrolled; 13 average attendance; 1 $500 schoolhouse. Summit Independent: 22 enrolled; 15 average attendance; 1 $1,200 school. Casey: 1 male and 9 female teachers; 473 enrolled; 395 average attendance; 4 schoolhouses, valued at $48,000. Stuart: 1 male and 7 female teachers; 222 enrolled; 193 average attendance; 1 $8,000 schoolhouse. Twenty-six male and 261 female teachers. Enrollment of 4,105; average attendance of 3,219. Number of schoolhouses, 158; value $424,378. The first school taught in the Village of Greenfield was in the winter of 1859 in a room of the same old plank house which was used as a stage station by M. Clark. A. D. Littleton was the teacher of this pioneer school. The first schoolhouse was erected in the summer of 1861 and in this the first teacher was A. L. McPherson. This building was used for school purposes for several years. The old schoolhouse was built when the town was a sub-district of the District Township of Greenfield. On April 24, 1877, a petition was presented to the board of directors of the district, asking that sections 7, 8, 17, 18, 19 and 20 of Greenfield Township and 12 and 13 of Summerset be set off and formed into an independent district. The petition was signed by the following: A. J. Mears, T. A. Wilson, H. B. Rust, D. A. Coy, A. M. Hutchinson, J. W. Darby, John Burrell, Joseph S. Bartow, John Pegg, E. R. Olmstead, J. J. Myers, S. M. Shattuck, L. A. Smith, L. W. Devine, A. S. Carmichael. Charles Burrell, G. T. McConnell, M. F. Mills, L. S. Myers and Judson Morgan. In accordance with this petition the question was submitted to a vote of the qualified electors of the district and the election held at Dew's Hall on Saturday, March 10, 1877, and resulted in a vote of 42 to 9 for separate organization. An election was held for the purpose of choosing the officers of the same on March 24, 1877, and the following were elected: S. M. Shattuck, president; A. R. Dew, secretary; C. Heaton, treasurer; S. C. Vance, John E. Hill, J. T. Harvey, A. Dwigans and J. G. Culver, directors. Dew being absent from the county, J. A. Hetherington was appointed clerk in his place. By this time the school accommodations had become so cramped in the schoolhouse that rooms had to be rented in various parts of the town. Therefore, the directors ordered that the question of the district issuing bonds to the amount of $5,000 for the purpose of building a schoolhouse of larger capacity, be submitted to the people. Accordingly, at an election held May 23, 1877, by a vote of 40 to 10, the qualified electors ordered the issuance of the bonds. The schoolhouse on the south side of Greenfield was built during that summer. The contract for its erection was let to Stickel & Baldrick of Des Moines. The architect was W. K. Ball of Creston. The total cost of the building was $5,230. In the summer of 1883 another schoolhouse, costing $6,000, was built on the north side of town. At the first, as before mentioned, Greenfield was one of the sub-districts of Greenfield Township. The following is a list of teacher, with age of service: A. P. Littleton, 1859-60; Julia Taylor, 1860-1; A. L. McPherson, 1861-2; Sallie Valentine, 1862; S. C. Vance, 1862-3; Alice Lee, 1863; C. P. Gilbert, 1864-5; Mrs. Patterson, 1865-6; Doctor Edgington, 1866-7; Wesley Rodgers, 1867-8; Hattie Morris, 1868-9; Joseph McClain, 1869-70; H. J. Morgan, 1870-2; Hattie M. Leonard, 1872-3. From 1873 the schools required a principal. Dr. E. Spooner was the first. In the spring of 1877 the present independent district was organized. W. A. Pryor was the first principal. The history of the graded schools began with M. W. Haver. Principal C. E. Holland, 1882-4, completed the grading and graduated the first class. 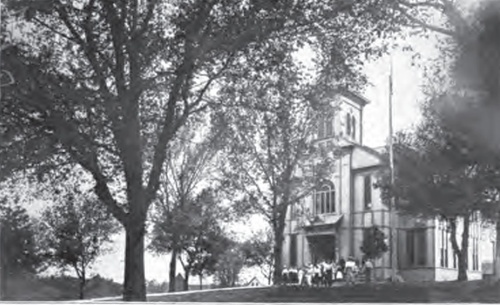 At a called meeting of the Greenfield commercial Club held in the courtroom, March 19,1906, the question of building a new $25,000 schoolhouse was discussed at length. There was a good attendance of the club members as well as a number of other citizens. The meeting was presided over by O. A. Tuttle, one of the vice presidents of the club. The discussion of the question was entered into by members of the Commercial Club and others and members of the school board. The testimony of various men was all to the same effect, that the condition of the old schoolhouse was unsanitary and a menace to the lives of the pupils and teachers. J. J. Hetherington talked at some length against the proposition on the grounds of expense to the taxpayers and W. W. Witham made a few remarks along the same line, but aside from these two gentlemen the members present were in favor of the improvement. At the conclusion of the discussion F. B. Wilson offered the following motion which was unanimously carried: "Resolved, That it is the sense of the Greenfield Commercial Club that we are in favor of building a new schoolhouse at a cost not to exceed $25,000." 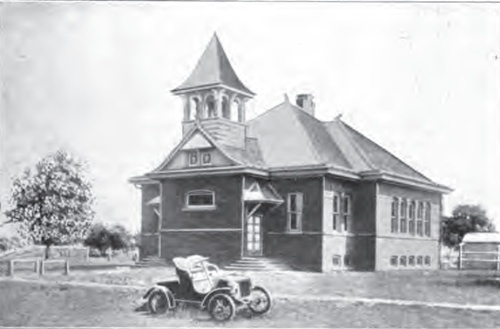 In July, 1906, the school board let the contract for the erection of the proposed schoolhouse on the south ward school grounds. A number of bids were received on the work and upon opening the bids it was found that the firm of McLead & Son, of Cedar Rapids, has submitted the lowest figure for the work, $16,700, so the contracts were accordingly awarded to this firm. The firm of W. R. Parsons & Son Company of Des Moines prepared the plans for the building on which the contracts were let. The architects made a blunder on the first set of plans they made, which called for a building which would have cost not less than $35,000, and a delay of about thirty days was occasioned by the necessity of drawing a new set of plans. The cornerstone of the new high school was laid on August 31, 1906, the ceremony of the laying being conducted by the Grand Lodge of Iowa, Ancient Free and Accepted Masons. The orator of the day was Hon. Edmund Nichols of Perry. Most of the business men and women of today can remember the district schools of forty years ago and how their early days were passed in the small cheerless schoolhouses of that time. Many of them were made of logs and in the center of the small room would be placed a large box-stove, capable of taking wood four feet in length. Most of the seats were made of long boards or of slabs with crossed legs for support. Several boards were placed end to end, one side was fastened to the wall and the whole, supported at an angle, was the writing desk for the big scholars while in front of these, without desks or backs, were other seats for the smaller ones. When writing hour arrived the pupil was obliged to put his feet over the seat and turn around to get the benefit of his desk. There were two school terms, summer and winter, school ma'ams teaching in summer and the school masters in the winter, the former receiving about one dollar per week and the latter ten to twenty dollars per month and "board around." In some of the districts even these stingy salaries were paid in farm produce. An estimate of the amount of fuel to be used was made, and each patron would be required to a certain proportion of the wood. The boys were required to take turns in building the fires and in sweeping the schoolhouse. At nine o'clock the teacher would rap on the door-casing to call school. First in order was roll-call, then the first class in reading, then the second class, the third class and the A B C's. No classes were called in arithmetic but from all parts of the room would come to request, "Do my sum." The teacher was required to write all copies for those learning penmanship. Who among the pupils of that time does not remember the copies? "Kings and Queens eat pork and beans;" "Commandments ten God gave to men;" "A man of words and not of deeds is like a garden full of weeds;" Many men of many minds," etc. Teachers were obliged to make all the pens from goose-quills and during writing hour the snapping of pens on the desks and "Mend my pen!" might be heard frequently. In those days Cobb's Readers, the English Readers and Hale's History were the principal reading books and counting aloud for the pauses --- one for a comma, two for a semicolon, four for a period, etc. --- gave a peculiar style of reading not popular at the present day. The Columbian Spelling Book with its wooden covers and Noah Webster's with its pictures of the boy stealing apples with the accompanying story of the owner trying grass and turf first, then stones, to induce him to come down; the fox and the sour grapes; the farmer and the lawyer in regard to the goring of the bull --- these were the spelling books. Peter Parley's Geography, with the lessons illustrated, the first one with the picture of a boy facing the sun, with his right hand pointing east and his left pointing west, this and Olney's Geography were the principal text books on the subject. In arithmetic, Dillworth, Adams and Dabol took the lead. Who cannot remember Dabol's. What is my age? Pray tell it me." Examples in pounds, shillings and pence were given there also in single and in double positions. In grammar, Lindley Murray's and Kirkham's were used, while the young orator of those days selected from the Columbian Orator, the United States Speaker and the American Manual and there were few boys who did not wax eloquent on Friday afternoons with Hohenlinden, The Greek and the Turcoman, The Burial of Sir John Moore, Patrick Henry's Address, Pitt's Reply to Walpole, etc. In those days the beech and the birch rods were known by all the mischievous boys while standing on one foot and bending over to hold down a nail with one finger. Standing on tip-toe and reaching a nail-head on the wall, having a split goose-quill on the nose and a paper cap on the head, standing on guard, hair pulling, ear boxing, flogging, etc., were common punishments. Sitting with the girls was dreaded more than it is now. Spelling schools, arithmetic schools and debating societies took the time of the long winter evenings, and going home with the girls made the evenings much longer and decidedly pleasanter.